Hipex RC is capable of extracting parasitic resistance and capacitance with high accuracy using complex routines that are employed in the design kits of advanced technology nodes. This is possible due to the built-in equations as well as options for custom-built functions for parasitic calculation. This example shows the usage of Hipex-C with technology files that represent the level of complexity seen in many advanced process technologies. Open Expert and load the example circuit in the Expert project hipex_ex08.eld and open the sample layout cell named DFF. Next, all extraction decks must be specified in the LPE setup in Expert by selecting Verification->Extraction->Setup , which opens the LPE setup window. Selecting the Technology tab in the left section of the window brings up the dialog box, in which the layer generation script ( silvaco_dev_extract.dsf ), the parasitic capacitance script ( silvaco_para_c.lisa ), and the parasitic resistance script ( silvaco_para_r.lisa ) must be chosen. Some of the ways that a custom capacitance function can be created to account for various layout conditions is shown in Figure1. 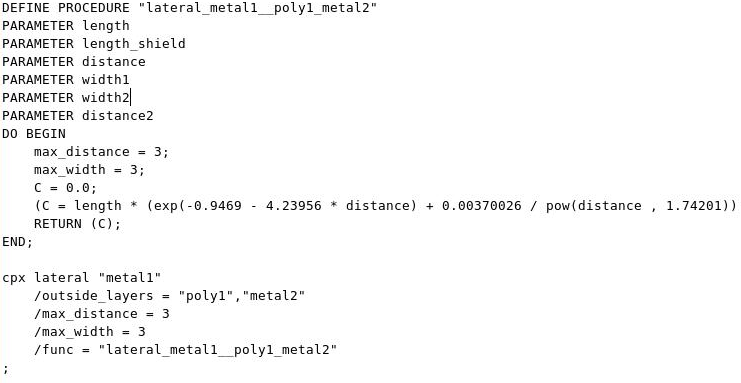 This example function will calculate capacitance using one of several different equations based on the specific layout condition that is encountered. Multiple factors are taken into account to determine what formula is used, such as distance between the shapes, the nodal information of the shapes, enclosure of one shape by another, and the width of the conducting shape. Hipex-C accounts for the vertical shielding that occurs when a conduction layer between two primary capacitance layers shields the capacitance effect between them by using the CPX ORDER statement to specify the order of conduction layers. Once the CPX ORDER is set, the vertical shielding effects are calculated automatically in the individual capacitance functions. 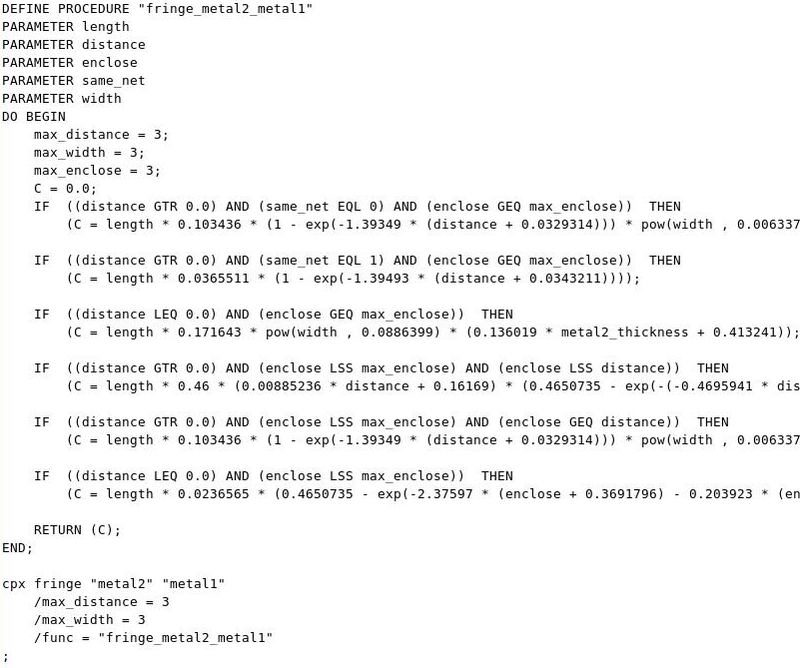 The option /INSIDE_LAYERS is available for lateral capacitance functions to account for lateral shielding. 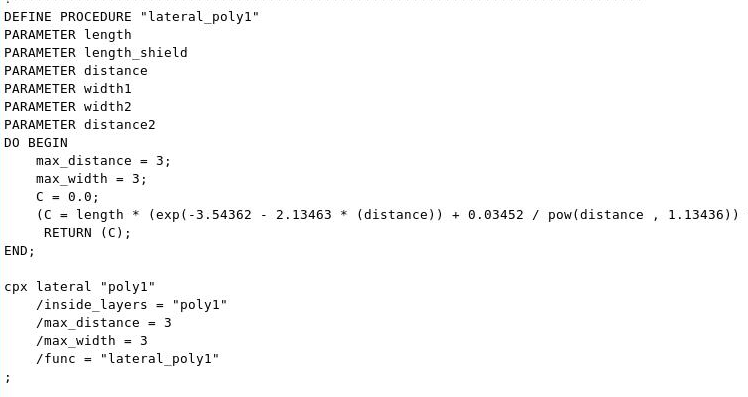 Figure2 shows a function that calculates lateral poly capacitance and uses the /INSIDE_LAYERS option. In order to extract an RC parasitic netlist using the example calculations shown, first create the derived layers and connectivity database by selecting Verification->Extraction->Hipex-Net->Run from the Expert menu. Then the RC parasitic netlist can be generated by selecting Verification->Extraction->Hipex-RC->Run. /max_width = 3    /func = "lateral_poly1"